Louisville, KY (December 7, 2012) – Kenneth Hayden, a row crop farmer well known and respected in Hardin County for his tireless community service work, has been named winner of the annual award for Distinguished Service to Farm Bureau. He was honored at the organization’s 93rd annual convention at the Galt House Hotel, receiving an engraved watch and a plaque. 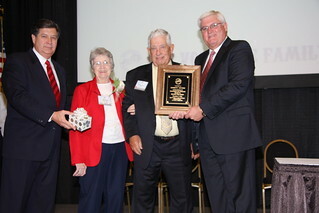 Kenneth Hayden (center) received the 2012 Distinguished Service to Kentucky Farm Bureau award at the organization’s 93rd annual meeting, held in Louisville. The award was presented by David S. Beck, KFB Executive Vice President (left), and Mark Haney, KFB President (right). Hayden, 81, served on the Hardin County Farm Bureau Board of Directors for 42 years and was president from 1970-73. His involvement with the organization extends through local, state and national levels. He has been highly instrumental in Hardin County’s development as one of the more accomplished county Farm Bureau organizations. His contribution to society, however, goes well beyond Farm Bureau. He’s been active with the Kentucky Corn Growers Association, United States Feed Grains Council, FFA, 4-H and Conservation District. Additionally, he has served on the Hardin County School Board, has been a church deacon for 45 years, was co-founder of the Cecilian Ruritan Club and has been a leader of an annual festival in Cecilia that has generated hundreds of thousands of dollars for the community. State Senator Dennis Parrett and Representative Jimmie Lee were among those who nominated Hayden for the KFB award. Hayden is a celebrated alumnus of the University of Kentucky, with a Bachelor of Science degree in Agriculture.